Dijon Salmon | Curious Foodie. Baked Dijonaise Salmon, Your Quick Solution To A Home-cooked Valentine’s Day Dinner. All you folks out there who’s planning to cook for your special someone tonight for Valentine’s Day, do not fret if you cannot think of what to cook. 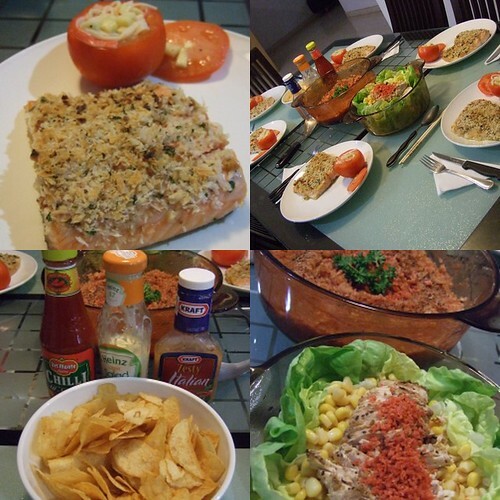 Here is my solution for you – Baked Dijon Salmon (pronounced as Sa-Men). The original recipe was retrieved from All Recipes. I rate this recipe 4.8 over 5 stars. Please ignore all the bad reviews on the All Recipes site, because my salmon always turned out perfect and I want you all to be able to impress others with this simple recipe. I’ve cooked this dish for my family, friends and boyfriend on previous occasions. All of them enjoyed it very much. I’ve changed the recipe servings (for two) and made other slight changes to the ingredients. I could not find a photo of the salmon alone, so please focus on the photo on the upper-left hand corner. 🙂 Note: These salmon fillets were huge, don’t worry if your fillets are much smaller. 2. In a small bowl, stir together butter, Dijonaise, and honey. Set aside. In another bowl, mix together bread crumbs, walnuts, and parsley. 3. Brush each salmon fillet with honey mustard mixture, and sprinkle the tops of the fillets with the bread crumb mixture. 4. Bake salmon for 12 to 15 minutes in the preheated oven, or until it flakes easily with a fork. Season with salt and pepper, and garnish it according to your Valentine’s preference.I hope this is useful to someone out there. Happy Valentine’s Day & Friendship Day every one, may this be a blessed day for all.